I’ve always wondered, is it gravlax? 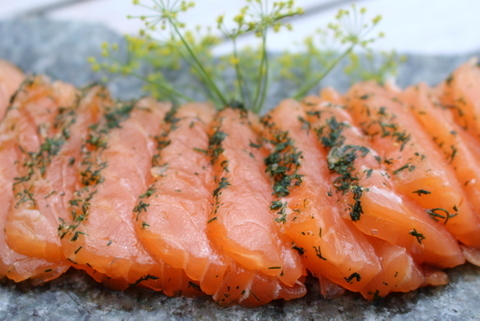 Or gravadlax? Let’s just call it dilled salmon. So much simpler – and so perfect to have on hand for summer evenings. [If you’re thinking you’ve got a touch of déjà vu, that’s because I’ve posted this at least twice before – no apologies for repeating, it’s just soooooooooo good.] 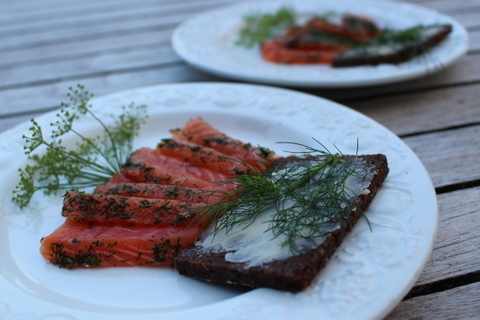 This is one of those recipes where farmed salmon works unusually well. How come? Farmed salmon is, let’s face it, a bit on the flabby side. Who can blame it? If you were wallowing about in a big cage at the mouth of a sea loch rather than fighting your way up the river above that sea loch (having fought your way across the ocean to get there), you’d be flabby too. The point is that by curing the fillet with salt and a smidge of sugar (and loads of dill, natch), you encourage it to release lots and lots of water. The result is firm, dense and packed with flavour. Try it. You need to plan ahead a bit with this one, as the fish should marinate for at least 12 hours and can be left in the fridge for up to 5 days in its marinade. 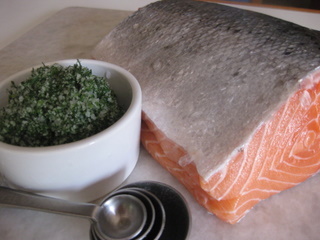 The recipe is for 2 equal-sized salmon fillets which you will sandwich together with the salt/sugar/dill mixture – that’s because it came originally from my brother (thanks Sim) who’s a keen angler, and he’s used to working with whole fish. If you have just one large fillet, that’s fine too – just put the salt mixture below and on top of the fish, cover and marinate in the same way. The recipe will feed anything from 8 to 12 people – all depends if you serve it as a starter (with brown bread or pumpernickel) or for a main course (with new potatoes and salad). Any leftovers (ha, dream on…) can be cut in tiny strips and served with fine pasta (paglia e fieno is especially nice – think pink salmon with green and white pasta), a splodge of sour cream and a sprinkling of fresh dill or dill flowers. Run your finger along the fish fillets towards the tail to locate the bones. Remove them with tweezers – a tedious but necessary chore. Mix together the salt, pepper, sugar and dill in a small bowl. Sprinkle one-third of this mixture in the bottom of a dish big enough to take the fish. Lay one fillet on top of the salt mixture, skin side down, sprinkle on another third of the salt mixture, rubbing it in well. Top with the other fillet (as if reassembling the fish), skin side up. Sprinkle with the remaining salt and herbs, and press them in well. 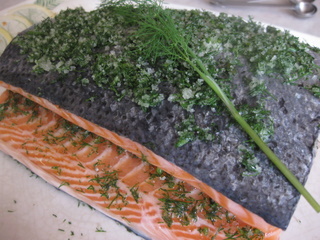 Cover the fish with clingfilm (plastic wrap), Place a board on top with a weight (e.g. a can of beans) and refrigerate for 12 hours and up to 5 days. It will make lots of juice – drain this off before slicing the salmon. Cut slanting slices (thick or thin, whatever you prefer) with a sharp, slender knife and arrange on plates or on a board or slate. PS What to drink with your dilled salmon (I knew you’d ask)? An Alsace Riesling (Cuvée Frédéric Emile from Trimbach, or one from Zusslin) would be wondrous. Alternatively go for an Albariño from Zárate in DO Rias Baixas, or a succulent white blend of Albariño, Treixadura, Godello and Loureiro from Finca Viñoa in DO Ribeiro, both featured in my recent post on Galicia. Previous: Previous post: In the Mood for Asparagus: Spring Green or Mighty White? An old one but a good’un – love it too, especially in this glorious weather. How’s the temperature over your way?